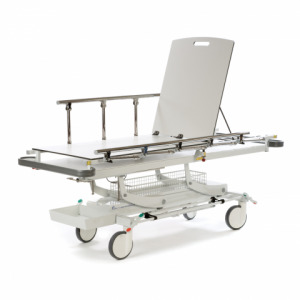 The SEERS Medical Orlando A&E Patient Trolley has been designed to assist in patient transportation, examinations, and x-rays, with large castors for easy manoeuvrability between departments. It is ideal for use in acute healthcare departments, and includes side support rails, a foam mattress, and a telescopic IV pole as standard. The Orlando A&E Patient Trolley has been designed to provide patients with reliable support and transportation in acute healthcare environments. As it includes an IV pole with integral storage facility, as well as a storage basket and tray that can accommodate oxygen cylinders up to size F, the trolley is suitably equipped to provide versatile and quality patient care. The trolley is also suitable for full x-rays, and incorporates an easily accessible full-length cassette platform into which an x-ray cassette can be inserted and positioned from either side. This helps to ease the process of x-rays for both patient and medical professional. Further enabling the trolley to be used in a versatile range of settings, the A&E Orlando Trolley is widely adjustable. The height can be altered from 63cm to 95cm for safer access, and the backrest can also be adjusted to +90˚ for patient comfort and support. The trolley also accommodates Trendelenburg tilt -12˚. This further allows the trolley to be used during a multitude of examinations for versatile use and subsequent value for money. 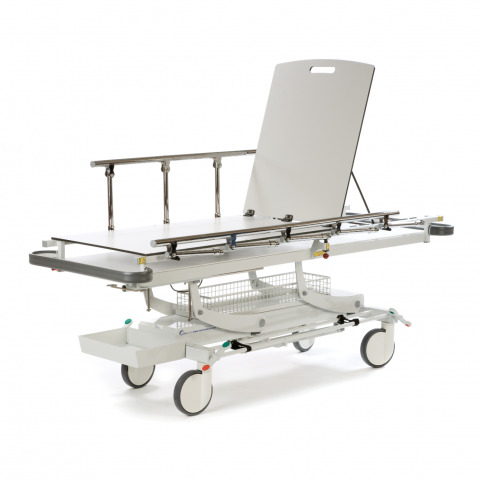 The SEERS Medical Orlando A&E Trolley includes a 100mm foam mattress as standard. This helps to boost patient comfort during examinations and transportation. SEERS Medical products have an extended warranty for peace of mind. SEERS Medical offer a five-year warranty on hydraulic and electric actuators, and a five-year unconditional guarantee on all parts, excluding damage to upholstery. As well as the above, frames have a lifetime warranty. Please note that all Terms and Conditions apply. As this product is manufactured to order, it is unfortunately not possible to return it for a refund. Please take this into account when making your order. If you have any questions regarding this returns policy, please contact our Medical Supplies Customer Care Team on 020 7501 0593 for further details. Please note that the SEERS Medical Orlando A&E Patient Trolley has an estimated delivery time of approximately four weeks. We apologise for any inconvenience that this may cause and advise you to consider this lead time when placing your order. If you would like any more information about delivery expectations, please contact our customer care team on 020 7501 0593.